July Newsletter is available for viewing. We invite ideas for stories from our readers. Please contact one of our staff members to submit a recommendation. We also are reaching out to the community for writers. If you have a flair for writing and would like to volunteer, please contact our staff. Hi everybody, how are you ? This year Easter will be on April 1st, what a strange combination……. I know that this newsletter will arrive in your house after that date, and I hope all of you celebrated an incredible Resurrection of Jesus. Over the past month the Center has organized the Feast of San Joseph, which was always an incredible success, but I would like to take a moment to say THANK YOU – GRAZIE to all the volunteers that made it possible. Now I would like to talk about something happening in Italy in the month of April. April 25 celebrates Festa Della Liberazione (Liberation Day) as a national holiday. It commemorates the end of Nazi occupation of Italy during World War II. This is not to be confused with June 2nd which is another holiday celebrating Republic Day. On April 25, 1945, the National Liberation Committee Of Upper Italy, in a radio announcement, proclaimed the insurgency and seizure of power proclaiming the death sentence to all Fascist leaders ( including Benito Mussolini ). By May 1st, all of northern Italy was liberated including the cities of Milan, Bologna, Genoa, Turin, and Venice. This liberation put an end to twenty three years of fascist dictatorship and five years of war. April 25 symbolically represents the beginning of a historical journey that led to the referendum of June 2, 1946, when there was a national vote and the Italian population chose to end the monarchy and create the Italian Republic. This was followed by the adoption of the Constitution of the Republic in 1948. A bill was created in 1946 designating April 25 as a national holiday and in 1949 this date was declared a permanent holiday. I hope to have captured your interest with some history in the Italian Independence Day. Please continue to support the efforts of the Italian American Cultural Center of Iowa in order to spread our culture throughout our community. Ciao come state ??? Hi, how are you ??? Siamo entrati in Quaresima. We are in Lent. The last day of Carnival was on February 13th, but for the Milan diocese it was the 17th and now we are all in Lent. I know for some of us, besides the religious moment, it means to give up something and for others it is signified by eating fish on Fridays. I would like, in this President’s Corner, to try to explain the history of two traditional Italian desserts that are present in the Italian culture to celebrate the Resurrection of Jesus. The first dessert is called La Colomba Pasquale (literally translated as “The Easter Dove”). This is considered by many to be the counterpart of the well-known Christmas desserts Panettone and Pandoro. Similarly to these Christmas desserts, the Colomba is made from flour, eggs, sugar, and yeast but it differs (from Panettone) in that candied orange peel is added instead of raisins. The shape of the dough is in the form of a dove and then topped with pearl sugar and almonds before being baked. The Colomba was originally conceived by the publicity director of the Milanese baking company Motta, Dino Villani, during the 1930s. He wanted to continue using the same ingredients and baking methods that were used for their Panettone but gear it towards the solemn period of Easter. In 1944 the recipe was taken up by Angelo Vergani who founded the company Vergani Srl in Milan who still produces this cake even today. 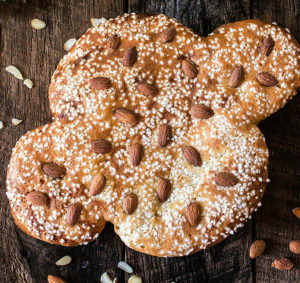 Some prefer to believe that the Colomba Pasquale has its origins from legends dating back to the 7th Century when the Longobardo Queen Teodolinda was hosting the Irish abbot Saint Colombano along with his monks. An extravagant dinner was planned with delicious meats however, even though it wasn’t a Friday, Colombano and his guests refused to eat the meats during the Lent period of penitence and sacrifice. Queen Teodolinda didn’t understand and became offended. But, Colombano came to her rescue and raised his right hand and made a sign of the cross. At that moment the meats were transformed into candied doves made from bread. The Queen was so grateful that she gave Colombano some territory and there was built the San Colombano Abbey that today is located in Bobbio. 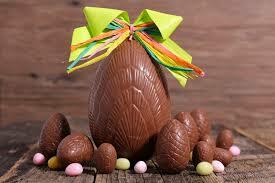 The second dessert is the “Uovo di Pasqua” meaning Easter egg. The traditional large chocolate egg that is filled with toys is fairly recent, but the giving of decorated eggs goes back to Medieval times. It was Medieval thinking that the heavens and the planets were two separate hemispheres and these created the egg. Ancient Egyptians believed the egg to be the fulcrum of the four elements (water, air, earth, and fire). Exchanging eggs was part of the Persian culture that represented the arrival of Spring. Catholics used the egg as a symbol of life and of the risen Christ. In early times, the egg was boiled in water with leaves and flowers so that it would take on a golden color. Medieval times also saw the beginning of creating artificial eggs that were decorated in precious materials including gold, platinum, or silver which were presented to the aristocrats and noble families. Peter Carl Faberge began his prestigious egg decorating in 1883 as a special gift for Tsar Maria. In modern times, many decorated eggs are collected and not eaten until after Lenten fasting. During the 20th Century the larger chocolate eggs became very popular. These eggs ranged in many sizes and most of them contained a surprise inside its hollow center. Initially the eggs were manufactured by prestigious bakers but has now become quite diffused all over the world. I wish you all a blessed and thoughtful Easter season. The Italian-American Cultural Center of Iowa will present their 21st annual St Joseph Altar celebration on Sunday, March 18 and Monday, March 19. Doors will open at 5:00PM, with the program beginning 5:30PM. The blessing of the altar and a traditional Lenten meal will take place on Sunday evening. All day visitation is Monday, with refreshments at 9:00AM. A light luncheon will be served from 1:00PM to 2:00PM. The entire celebration is open to the public free of charge. 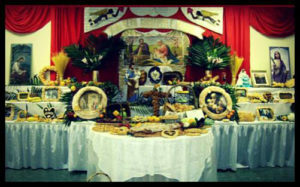 Families are invited to sponsor an altar and provide decorative items, such as statues, family pictures, artifacts, etc. Flowers for each altar will be provided. The suggested donation for each altar is $50. If you are interested, please call 515-244-4672 or 515-250-8804 no later then March 1. Several days are involved in making the traditional St Joseph cookies and breads. All participants are welcome. Please call 515-250-8804 or 515-244-4672 if you would like to attend the evening session. I hope you have had a good January. The weather varied from frigid cold to mildly sunny but we survived. In February we will begin our yearly events starting with an Italian conversation class every Wednesday for 8 weeks. Please sign up if you’d like to participate in this. 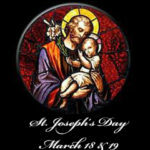 Naturally, all of the preparations of our St. Joseph event are going to start in the middle of February and culminate with the Feast of St. Joseph in mid-March. As I began to think about this month’s article I reflected on some of the many treasures displayed in the museum at the Italian American Cultural Center of Iowa. One of these treasures is the many examples of Murano glass. 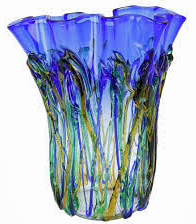 Murano Glass is made in Murano, one of the over 150 islands that make up Venice in northeast Italy. Murano’s glassblowers were (and still are) leaders for centuries on a European and worldwide level. They have become masters of this art and, in many cases, pass on this art of glassblowing to generations within the same family. 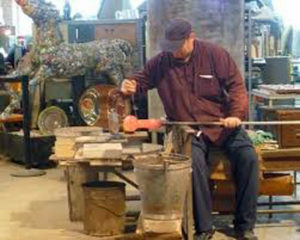 Centuries-old techniques are still used today by Murano glassblowers to create massive and elegant chandeliers to figurines to stemware to wine-stoppers. Styles range from very traditional to extremely contemporary. Murano Glass consists of 70% silica sand added to 30% stabilizers usually made up of soda and lime. These stabilizers allow the glass to melt at a lower temperature and also prevent the glass’s solubility in water. Murano Glass starts out colorless. By adding small amounts of minerals, oxides, and chemical derivatives to the base powder the glass can take on an infinite combination of transparent, opaque, or alabaster colors. 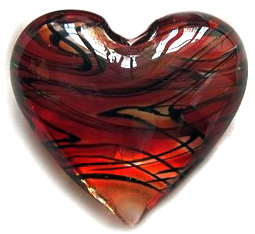 Curiosity: it is impossible to obtain the color black in Murano Glass. If one looks very closely (or holds the object up to the light) the true color will be either a dark blue, dark purple, or dark green. Yet the color is so intense and dense that it appears black. Our own museum houses many examples of Murano glass coming from some of the most prestigious and famous glass factories in Murano, including Salviati, Seguso Viro, Barbini, and Carlo Moretti just to name a few. Please take time to visit our museum at the Italian American Cultural Center of Iowa. Please support the efforts of the Italian American Cultural Center of Iowa in order to spread our culture throughout our community. 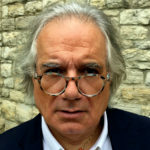 E siamo arrivati al 2018! We have arrived to 2018! So much has happened in 2017 and I am sure much will happen in 2018. During this past month, Santa Lucia and the two (and not one) cookie classes were a huge success and well attended. Be ready for more of these types of events continuing throughout 2018. In January our Event Committee will meet and be busy organizing the Calendar of Events for the whole year. We hope to publish this with our February Newsletter, so be looking for opportunities to become involved and to attend. On January 24th we will be offering a class featuring three typical Italian soups. Please visit our website for additional information. Please remember to look for our newly formatted Newsletter that will also be available on our website in the 1st quarter of 2018. 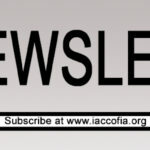 “Subscribe” to our website at www.iaccofia.org to receive notifications of each new posting. As we begin the New Year I began wondering how we determine the start of a new year. I began researching and found that previous to our Gregorian calendar, the world used the Julian calendar method. Yet, what was used before this to count days and seasons? It was the Roman calendar that was used by the world. 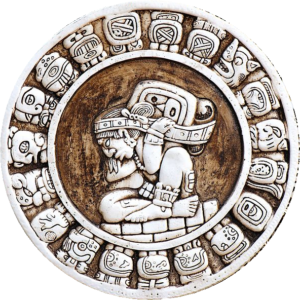 This was mostly an observational lunar calendar whose months began in conjunction with the first signs of a new crescent moon. Since each lunar cycle is about 29.5 days long, each month lasted between 29 and 30 days. However, twelve months of this fell 10 to 11 days short of the solar year, so this was made up through some form of calculation during the winter months. 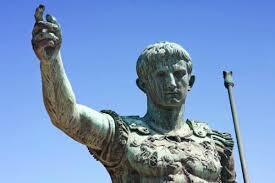 That way the Romans were able to maintain their seasonal religious festivals. The Romans eventually organized their year as one with ten fixed months, each containing 30 or 31 days. The nearly 60 days missing were, again, made up during the winter months as additional days belonging to no month, were added until it seemed everything was back in its’ proper place. The Julian calendar was proposed by none other than Julius Caesar around 45 BC and took effect on January 1 by an edict. He was hoping for a more accurate timeline for sowing and harvesting crops. This calendar had a regular year consisting of 365 days and was divided into 12 months. An added day (leap day) was added to February every four years, thus, the calendar was 365.25 days long on average. This was intended to approximate the Solar Year. However, Greek astronomers had known that the Solar Year was slightly shorter (11 minutes) than 365.25 days and this Julian calendar did not compensate for this difference. As a result, this calendar would gain about 3 days every 4 centuries. 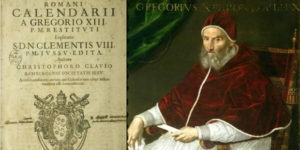 The Julian calendar was not corrected until 1582 when Pope Gregory XIII issued the Gregorian Reform establishing what is known as the Gregorian Calendar that is currently used even today. The Gregorian calendar has the same months and days as the Julian calendar, however, this calendar does not add a Leap Day in years that are divisible by 100. The exception for this is when the year is evenly divisible by 400, which is why the year 3000 had 29 days in February. However, there will be no Leap Day in the year 2100 or 2200, for example. Countries, including Italy, Spain and France converted from Julian to Gregorian immediately in 1582. Great Britain didn’t switch until 1752. Greece didn’t stop using the Julian calendar until as recently as 1922. Some wonder why Russia didn’t switch to the Gregorian calendar with the rest of Europe. Many believe this was due to the fact that this calendar was introduced by a Roman Catholic Pope. Russia did eventually switch over in 1918. Thanks again for your support in 2017 and I kindly request your continued support of the efforts of the Italian-American Cultural Center of Iowa in 2018 in order to spread our culture throughout our community.